Unfortunately too few tourists know about the beauty of Bang Kachao: the best urban oasis of Asia. 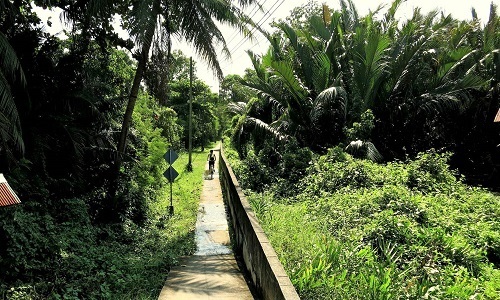 It’s hard to believe that you can find a dense green jungle, easy bicycle paths and absolute tranquillity, just a stone’s throw from the very heart of bustling Bangkok. Nowadays lush green Bang Kachao has so much to offer that it would be a pity to head back to Bangkok’s concrete jungle after just a few hours. 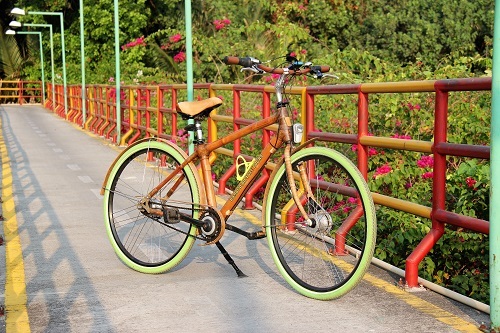 Enjoy a tour on bamboo bicycles through an extensive network of save bicycle lanes and spot birds and mongooses. End your day with a drink with a view over the river and Bangkok on the background. 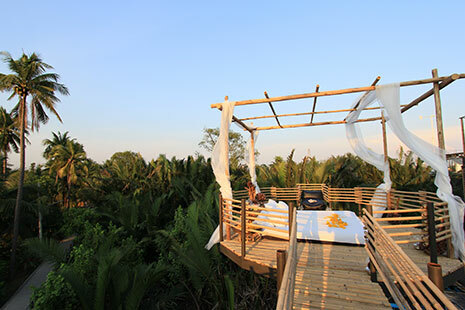 Imagine: after your exiting bicycle tour, you’ll find yourself on the rooftop of your tree house. Sipping your drink and watching sunset over the jungle and the river. A great dinner is waiting and after that you’ll sleep in a comfortable bed in your tree house surrounded by jungle. To create an unforgettable Bang Kachao experience the Bangkok Tree House and Bamboo Bicycle Tours Thailand joined together. We are natural partners because we share many common values, such as taking good care of nature, high quality standards and giving our guests unique experiences. That’s why we decided to offer you a unique bicycle tour and a comfortable overnight stay including breakfast in breath taking green surroundings. We truly believe that working together will be beneficial for you as our guest. We will provide you with a high class activity in combination with ultimate comfort and tranquillity. Just as your holiday should be. Booking is easy. You can book your tour and your room in just one online form on this website. It’s up to you whether you book your room the night before or after the bicycle tour. 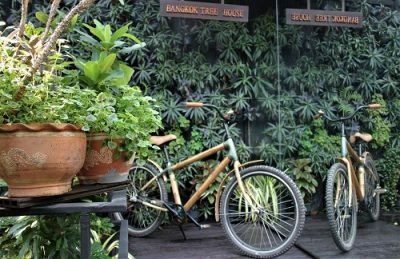 Bamboo Bicycle Tours Thailand and the Bangkok Tree House hotel are looking forward to welcome you in Bang Kachao, Bangkok. PS: we enjoy a peaceful location on a pleasant distance from the airport. Therefore we are very suitable for the first or last few day(s) of your vacation even as fully unwind from your trip or to enjoy your stay in Thailand.